Have to say that AJ from The Lost Collector blog is becoming one of my biggest suppliers. 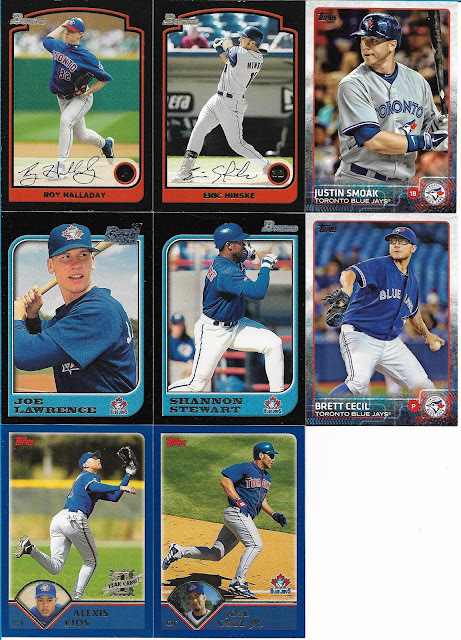 A few weeks back he sent me a PWE with 3 high number SPs from this year’s Heritage set, and on Saturday I received my 2nd PWE from him in 2017 full of more Blue Jays goodness. I see this card on the top of the pile and think “great, must be the last card I need for Fleer ’91! will be great to get that off the want list.” Turns out, I already have it. Then I look and see the hair cut on Glenallen Hill. So that’s why he saw spiders in his sleep…. People can rip Donruss all they want. I really like this design. Not enough to collect the entire set, mind you, but for sure I’ll chase the Jays from ’17 Donruss. 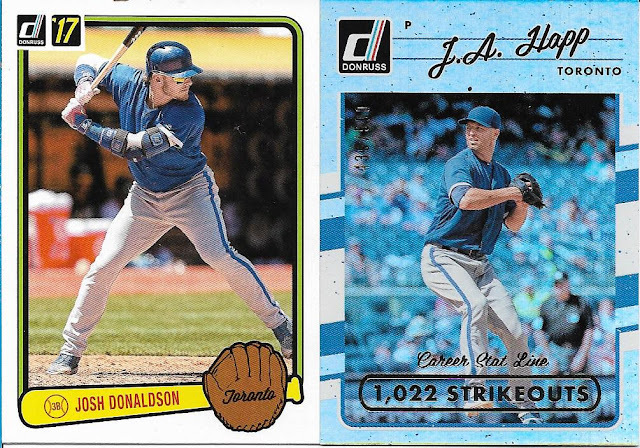 The Retro Variations are cool, featuring the ’83 Donruss design. Who says Heritage is the only release that can feature old sets? I always thought the Career Stat Line parallels were numbered to the stat on the front. In this case, the J.A. Happ card should have been #’d out of 1022. Maybe it’s hockey I’m thinking of where Panini numbers the stat line cards like that. It’s still going to take me a while to get over EE leaving town. I don’t think Kendrys Morales is going to have the same effect in the line up that Edwin did. Or is it the parrot leaving on Edwin’s arm that has me upset? The JD heritage card goes right into the set I’m putting together. Just another reminder that I have to get that want list up on the blog. AJ, awesome as always and totally unexpected!! Thank you very much, they are appreciated. Just set it and forget it. That’s what I did with this card in my ebay cart. 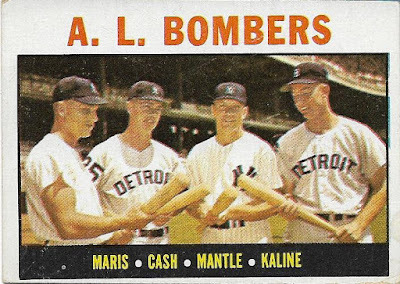 About 3 weeks ago I was hunting for the final 3 cards from the ’64 Topps set I’m building. I found all 3, but didn’t care for the total price combined. So I let them sit there. The Luis Aparicio card sold. The Mike Joyce card sold. But last week, this beauty was still sitting there. At $36, I was foolish to wait as long as I did, but thankfully I was able to buy the card and today it arrived. A little off center, sure. Top left corner is dinged a bit. A bit of dirt on the back. It’s all good. I just had to have this, and now that I do I’m just 2 cards from finishing off the set. $1743 – $36 =$1707 left to spend in 2017. I’ll have another one of the budget posts this week. I actually received this envelope last week from Gavin who runs the Baseball Card Breakdown blog. I did show off the piece de resistance last week on the PC blog here, but actually took my time deciding whether I wanted to do one or two posts with the bounty I received. 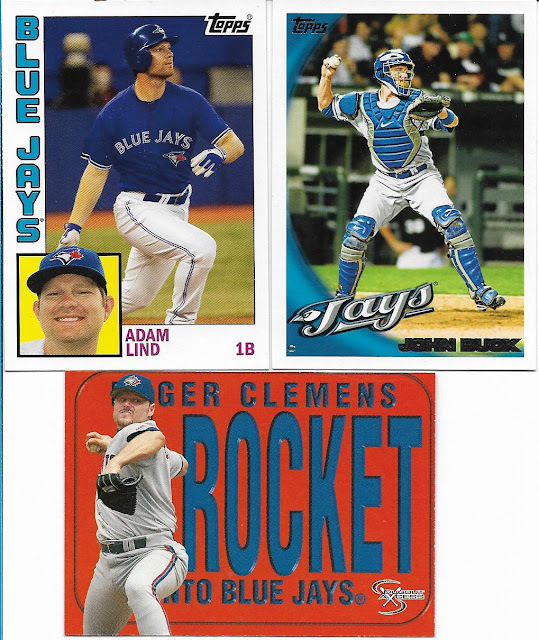 A big winner so far for Topps has been the inclusion of past cards with the Rediscover Topps stamp on them. 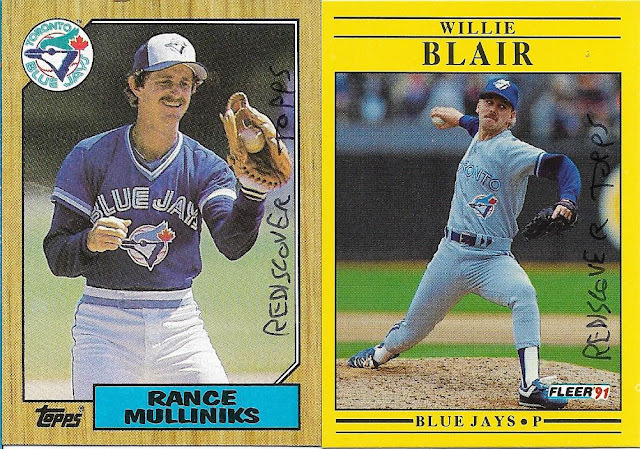 Gavin was kind enough to send a couple my way, including the legendary ’87 Topps Rance Mulliniks card on the left. A little bit of vintage came way, totally unexpected! 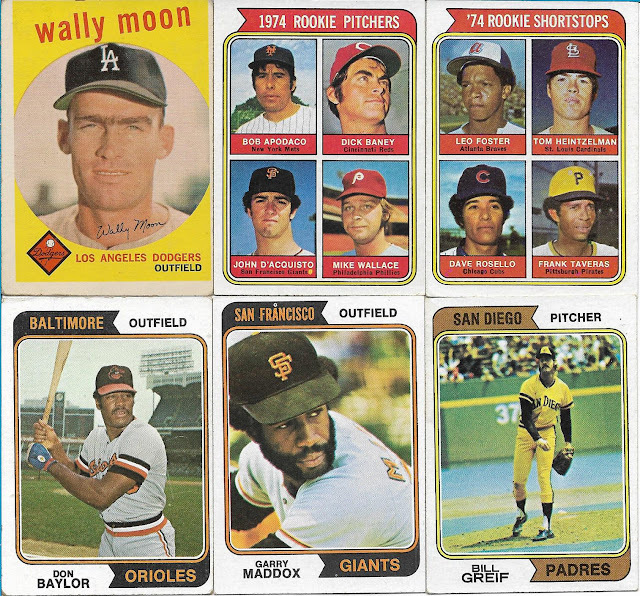 The master of the unibrow and his high numbered ’59 Topps card was a welcome find for sure, and the handful of ’74 Topps cards put another dent into that want list. 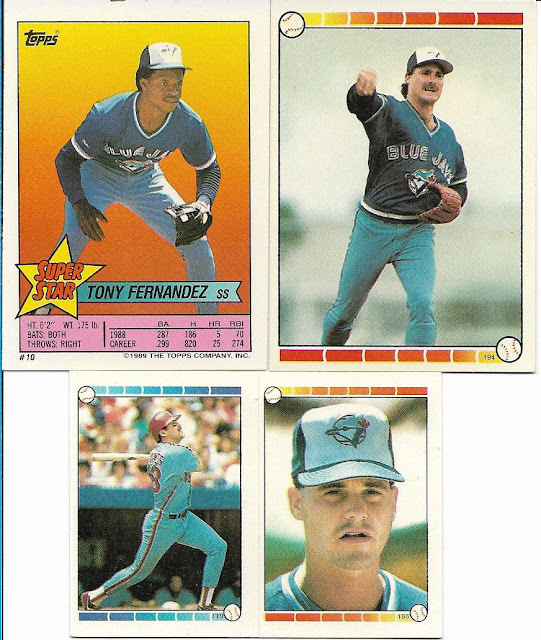 I wonder if Bill Greif was any good…..
Pairs of Blue Jays cards came off of various want lists. 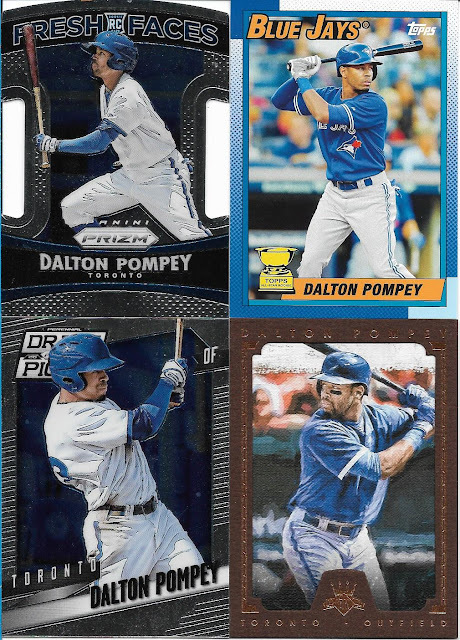 This also reminds me that I really need to update my Jays want lists for 2016 and 2017, as the Smoak and Cecil cards came from last year’s flagship series 2 release, which I’ve never made a want list for. Shiny stuff. 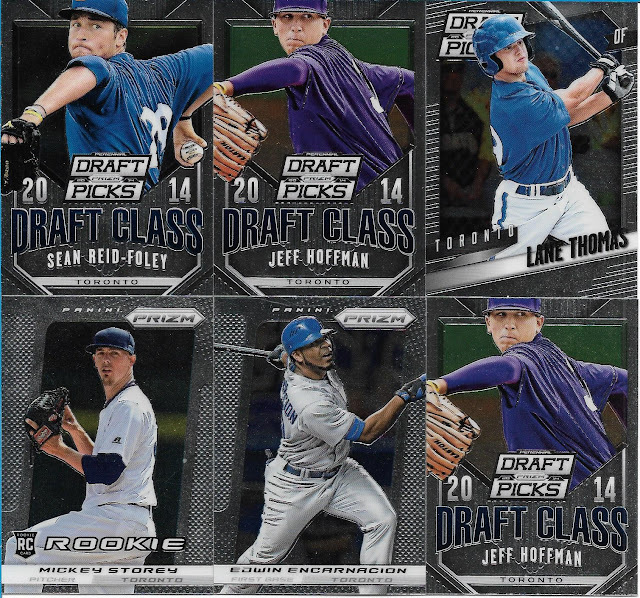 Don’t know if the Jeff Hoffman cards are duplicates, or some kind of crazy variation that I don’t know about. Donruss, another set that I’ve never bothered making want lists for. Damn I’m behind on the time. 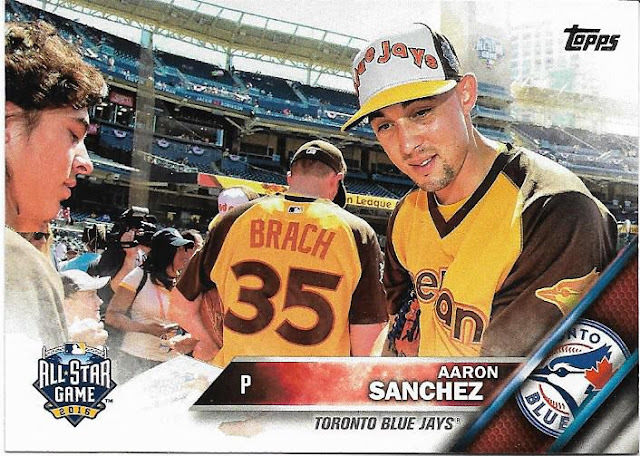 Love the retro variations though, which I see that Donruss brought back again this year. Some guys just don’t like the fact that you brag about being in the warm weather all the time and have to throw a bunch of snow your way just to bring you back to earth. Miiiiiiiiiiiiiiiiiiiiiiiiiiiiiiiinnnnnnnnnnnnnnnnnnnnnnnnnnniiiiiiiiiiiiiiiiiiiiiiiiiissssssssssssssssss (registered trademark of the Night Owl, used with permission). When you find success with a card, what do you do? You print some more of it as part of a separate release. Why not, right? Whomever said that Pompey was destroyed by Mt. Vesuvius better think again, as Gavin hit me up with quite a few of the young Canadian’s cards. 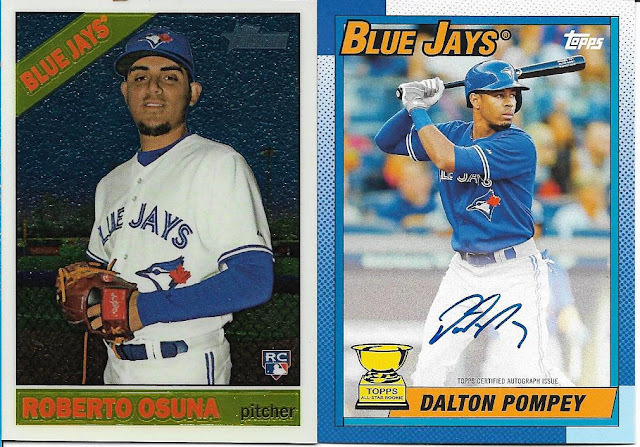 Finally to top off the package, here’s a ’15 Heritage Chrome refractor card of Roberto Osuna, along with a ’15 Archives Dalton Pompey auto!! On card no less, great stuff!! Gavin, thank you very much for the envelope, it’s very much appreciated!!! I’ve spent the past 7.5 months rooting for a team filled with kids. A lot of them either A) barely able to shave, and B) cannot buy alcohol in the US of A. But you know what, it doesn’t matter that these are kids anymore. The Maple Leafs are headed to the playoffs. It’s been such a struggle to get there for the past decade, I’m in a state of delirium. This post is probably going to meander and not make a whole lot of sense to anyone who isn’t a Leaf fan, but to be honest I don’t care tonight…. These three were a line for a good portion of the season, until the coach took Nylander off the line and put him with Auston Matthews, now a 40 goal scorer in the NHL. They’re going to the playoffs. These two have been linemates for quite a while now, the last few seasons with Phil Kessel, and this year with young phenom Mitch Marner. They’re going to the playoffs as well. Looking to exorcise the demons of the 7 game playoff loss to the Bruins for years ago. 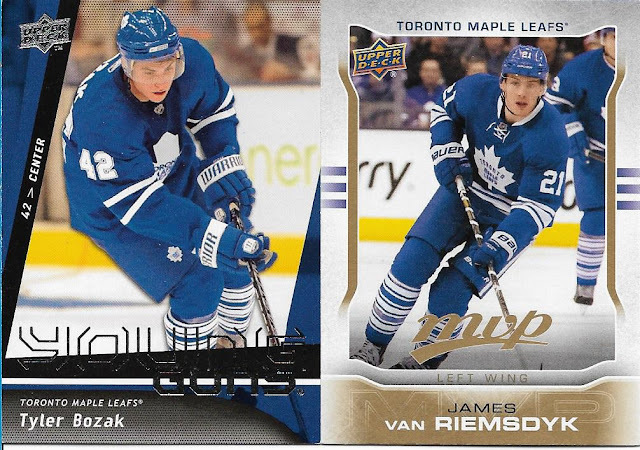 These two are probably the best defensemen the Leafs have right now. Rielly wasn’t a Leaf yet when the Leafs lost to the Bruins in 2013. 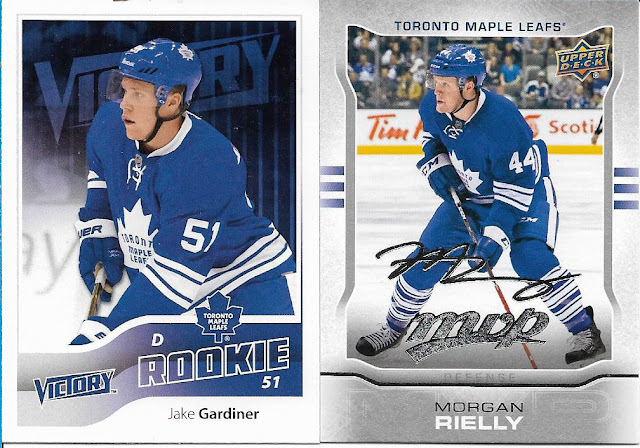 Gardiner had arguably the best series of anyone on the Leaf blueline that year with 5 points in 6 games, and was almost the goat tonight when he accidentally kicked in the 3rd Penguins goal. No matter, they’re going to the playoffs. Now this post would have been helped if I had cards of Matthews, Marner, Fredrik Andersen or any of the other dozen or so Leafs who helped get them to the playoffs this year. Oh well. Heaven help me if they actually win a series. Not to be outdone, Oscar from the Dodger-centric All Trade Bait, All the Time blog sent me 5 cards to rival the 5 I sent his way during the 100 words contest. Here’s the vertical 3. 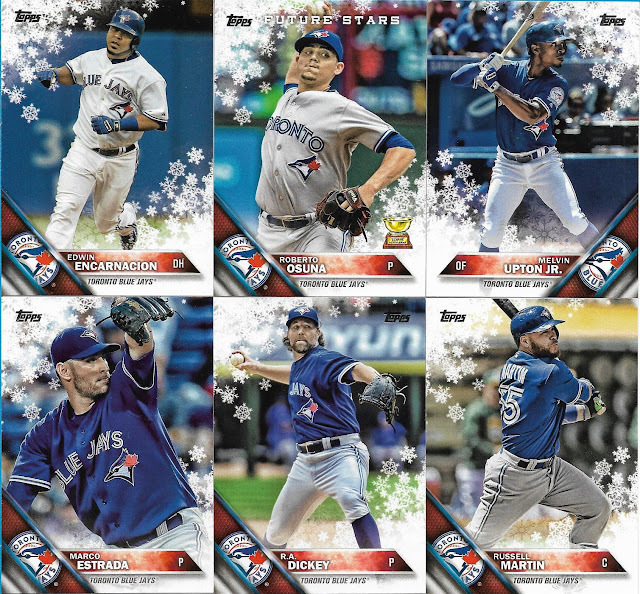 The ’16 Osuna I already have, but the Benoit/Bautista pair I certainly need for the 2017 Blue Jays team set. Love Benoit rocking the old school Blue Jays cap. Here’s the horizontals. Grilled cheese and the Blue Jays team card, if you please. 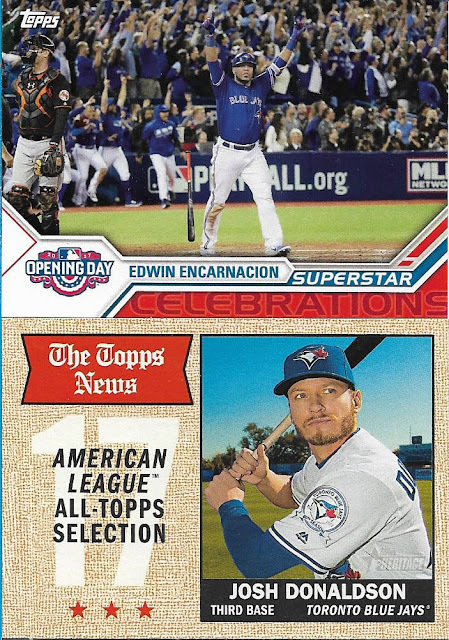 Two more cards off the Blue Jays ’17 flagship want list, which hasn’t even been created yet. In hindsight, I could have used these cards to try and do another 100 word post. But in the end, this post ends up short and sweet, just like a 5 card PWE should be. Oscar, thank you very much, the cards are appreciated!! 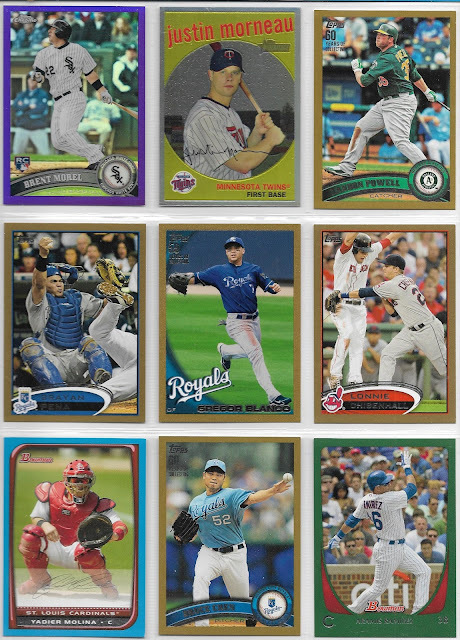 I completed a few errands yesterday morning and while doing so I decided to stop into Target a pick up a few packs of cards to see if I could pull something worthwhile for myself. I guess I don’t remember seeing anybody pull any of the Rediscover Topps cards from Heritage, so I was quite disappointed (to say the least) that this ’91 Jody Reed came out of a pack. Why Topps, why? The Anthony Rizzo HBP card looks pretty cool, but I’ll have to find a Cubs fan who would enjoy it more than I. The Trea Turner is a SP card, so now I have 6 of the SPs, and only need countless more. 4 packs purchased so far, just 3 doubles. Not bad, but there’s a long way to go. Despite my grumbling, I will pursue the ’17 Heritage set. Seeing as I finally picked up the final 3 cards for the ’11 Heritage set I need to replace it with something…. I also picked up a couple of rack packs of ’17 Topps flagship. Did as well as could be expected. Couple of first pitch and a couple of award winner cards here. Available to whoever wants them. I’ve pulled a few of the ’87 inserts, Dansby Swanson being the latest. 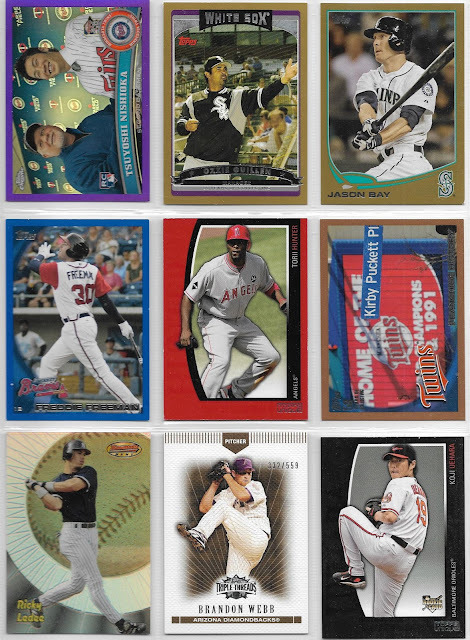 The Shin-Soo Choo card in the middle is a rainbow foil parallel. The George Springer card tells us that he wears #4 in honor of his parents and 2 siblings. These 3 cards are also up for grabs. As far as duplicates go, my luck has been horrible. I’ve bought 5 rack packs so far (36 cards in each), and have the equivalent of one of those packs as duplicates. From where I sit, that’s not too good. But I’ll still give this set a go anyhow, because I like the look of the design more this year than last. I’ll have want lists up sometime this week, as long as the Leafs chase for the playoffs doesn’t distract me horribly from my card pursuits. What am I saying? I didn’t post last week. I’m terribly distracted!! The 4 packs cost me $23 total, so $1766-$23= $1743 left for 2017. At this pace, I’ll spend just $1019 on cards this year. Maybe I should have given myself a raise a long time ago! I’ve been lucky a few times on twitter. 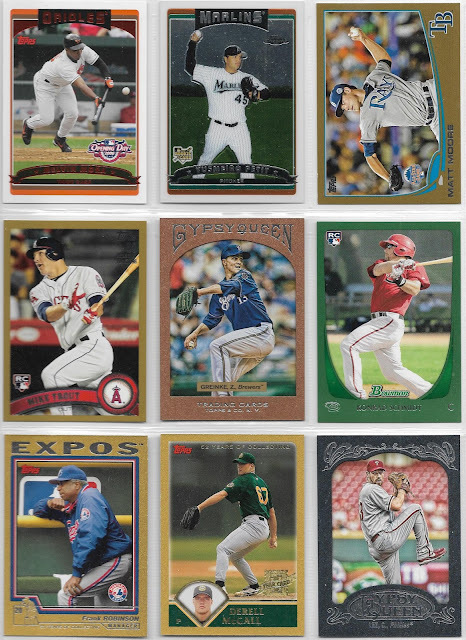 Following enough collectors on the site has led to me acquiring some great cards for my collection. This post represents a quick tweet from A.J. at the Lost Collector blog, offering up a trio of cards from the ’17 Heritage set. I was lucky enough to be the first one to raise my hand and snap them up. Needless to say, A.J. added a few other Blue Jays goodies to the envelope for me. These 3 were the only ones that were already part of my collection; I had to check on the top two to make sure, but the Rocket name plate on the bottom I instantly recognized as a past pickup. 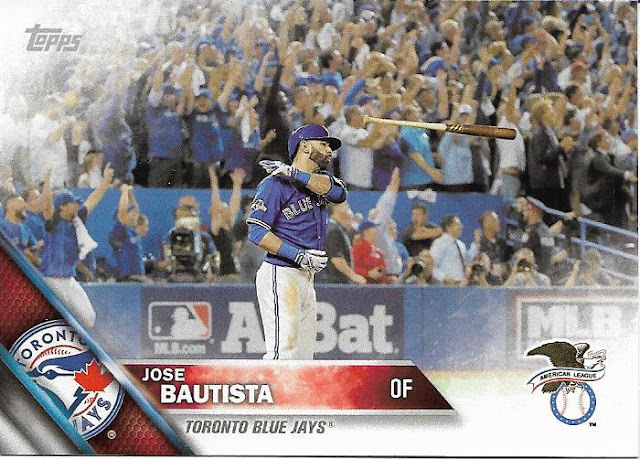 Yes, I needed this card for my Jays collection. No, I didn’t need to see “Blue Jays” written in the 80’s Padre style (my apologies to Padre fans, especially Marcus who is a long suffering friar follower). This was a welcome sight though! 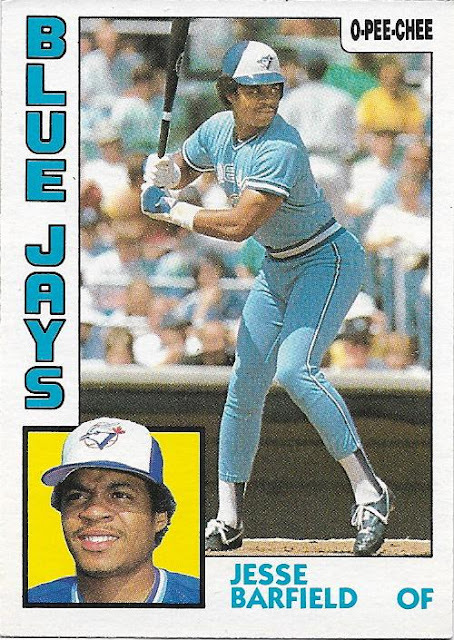 Jesse Barfield was one of my favorite Jays from the 80’s and this ’84 OPC was nice to cross off the want list. 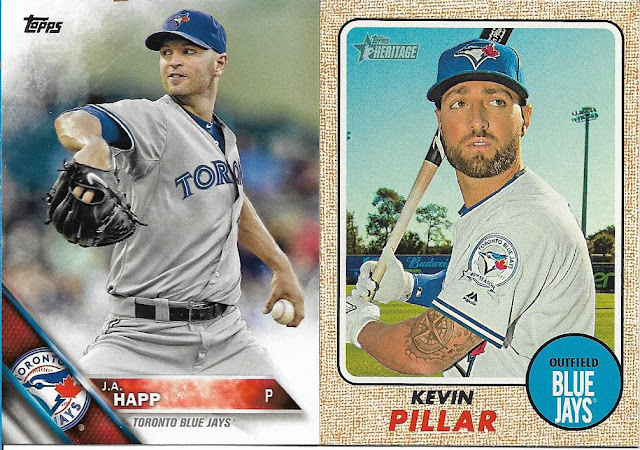 I’ve become used to Kevin Pillar cards featuring him diving full out. Those usually demonstrate his outfield skills. This one showing him diving into home is something new, and a great shot. 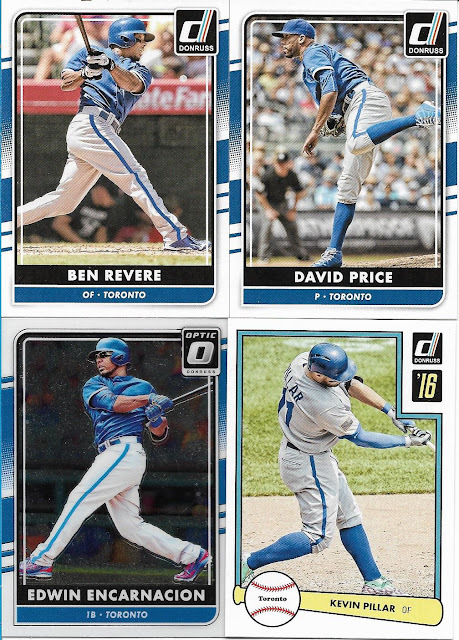 The Big 4 on the Jays card is a great shot, although EE will be missed (a regular theme here the last few weeks). Hopefully Kendrys Morales can pick up some of the slack. J.A. Happ should be donating some of his salary to Ray Searage. Ray helped turn his career around, and quickly while he was with the Pirates. Never noticed the tattoo on Pillar’s arm. Neat. Here’s the original reason for this post. A.J. offered up these three SPs from this year’s Heritage set. 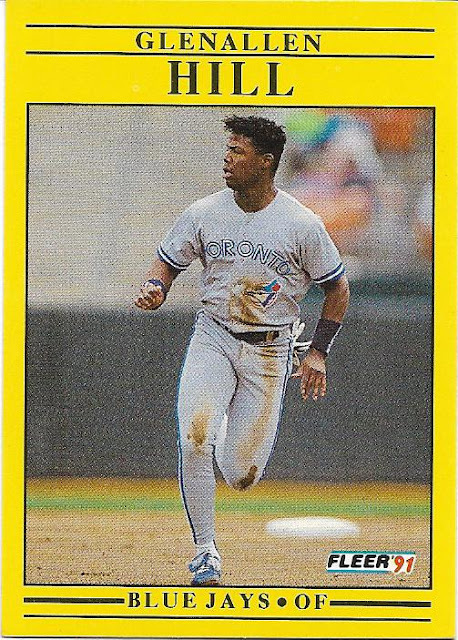 Just 95 to go (ugh, why Topps why!!!). A.J. thank you for the envelope, it is really appreciated! Hope you’re feeling better! The title for today’s post came real easy today. As I mentioned a week or two ago, I’m hoping to hit 200 followers by the end of the month. As of this morning, I only need two more to hit that magic number. Was very surprised to see the Mike Trout card, a gold parallel of his RC. 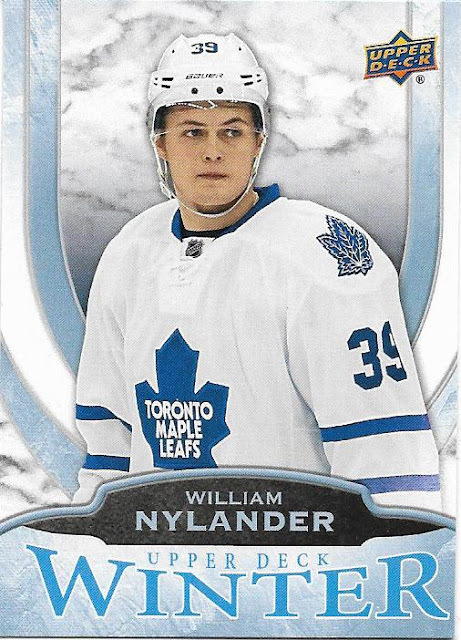 Had to look it up in Beckett, and it’s easy to see that this card will be the most expensive one in the set. I actually bought that card off eBay quite a while ago. Lucky me. The red parallels from 2006 Opening Day are also a favorite of mine, sadly I only have 2 of them in the entire set according to my spreadsheet. 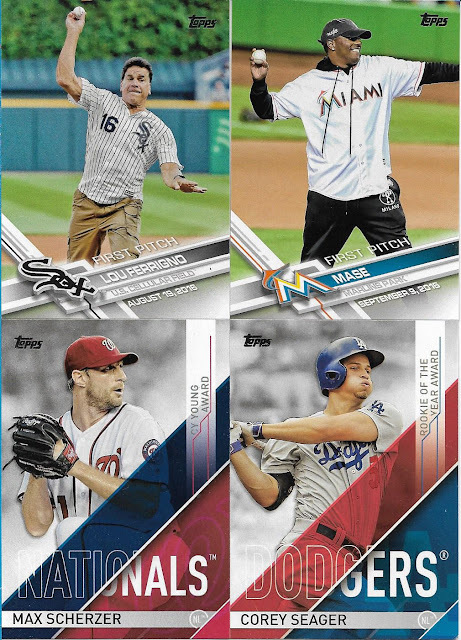 Kansas City takes a strong leap with 3 cards on this page, 2 of them back to back. The Brayan Pena card is a classic play at the plate card, ironically it didn’t come from Brian who runs the Play at the Plate blog (although he was responsible for 2 cards on this post). I also love the Yadier Molina card as well, the simple photo of him in the catchers squat is a great shot. Next time up, we hit the 40 page mark. Trying harder lately to avoid not posting on the blog for 4 or 5 days straight. In the past, I would chastise myself if I went a day without posting. Now, it’s become easier to go a few days without posting and not think twice. With there being plenty of pages to post for the SNI set, this is a good enough reason to get the lead out and write a quick post about the next page. This page has one of the best cards from the 2010’s on it (in my opinion). Hard to believe that it’s been 11 years since Kirby Puckett passed away at a very young 46 years of age…. Best card: Yep, the Minnesota Twins team card by a long shot. Oldie but a goodie: Ricky Ledee from ’98 Bowmans Best is one of only 15 pre 2000 cards that I own for the set. It also appears as if Ozzie Guillen is signing for the fans, a type of card that I always enjoy seeing. I have well over 100 more pages to show. I somehow have to convince myself that this post wasn’t so difficult and start to get more of these done. As I said in the video, a thank you to all who participated in the contest. There were some great entries. I will be in contact with the winners shortly to discuss what they might like for their prize.